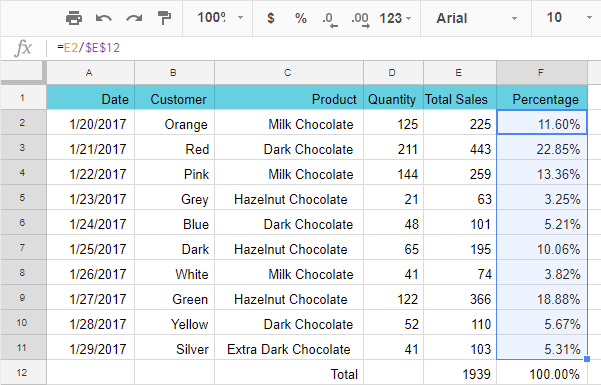 Google Sheets is a great platform to manage data tables. But are there any easy functions you can use for daily calculations? Find out below. But this formula will become extremely time-consuming if there are too many cells to take into account. If the range consists of adjacent cells, simply indicate its first and last cells even if there are empty cells somewhere between. Thus, you'll avoid enumerating each and every cell in the formula. The result will be inserted to a cell right below the selected range. Tip. Our Power Tools has an AutoSum feature. One click - and your active cell will return the sum of values from the entire column above. As you can see, I just added one more sheet into the formula and separated two different ranges by a comma. In my table where I keep records of all sales for the past 10 days, I can calculate the percent of each sale from the total sales. Turn E2 to an absolute reference - $E$12 - to make sure you divide each day's sale by the same total. 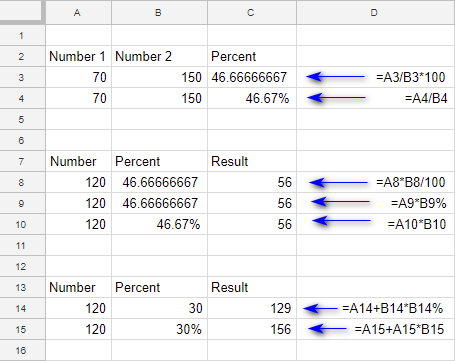 Apply the percent number format to cells in column F.
Copy the formula from F2 to all cells below - up to F11. Tip. To copy the formula, use one of the ways I mentioned earlier. If it returns 100% - everything's correct. Why do I recommend using the percentage format? Well, on one hand, to avoid multiplying each result by 100 if you'd like to get percents. On the other, to avoid dividing the results to 100 if you want to use them for any further non-percent math operations. I use the percentage number format in cells C4, B10, and B15. 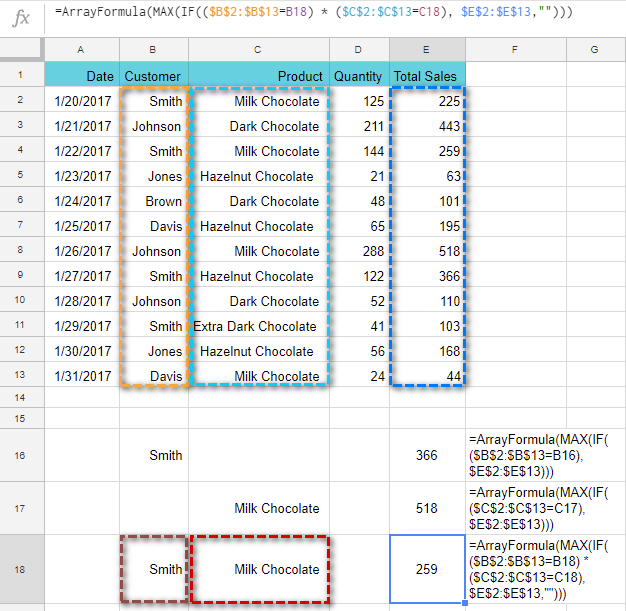 All formulas referencing these cells are much easier. I don't have to divide by 100 or add the percent symbol (%) to formulas in C10 and C15. The same cannot be said about C8, C9, and C14. I must make these extra adjustments to get the correct result. 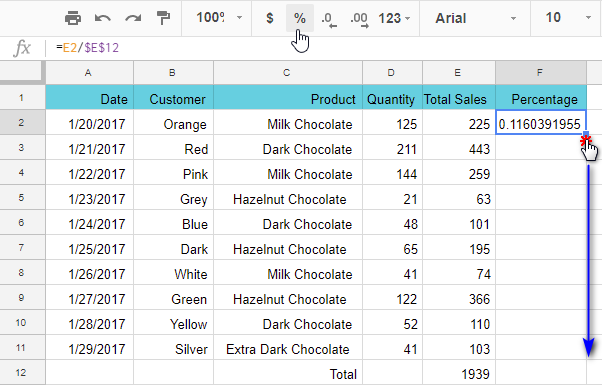 To work with loads of data in Google Sheets, nested functions and other more complicated calculations are used as a rule. Note. To finish any array formula, press Ctrl+Shift+Enter rather than simply Enter. I've got $259 as a result. Have you noticed what has changed? Just like that, juggling with values in cells you reference you can quickly get different results based on different conditions without changing the formula itself. Let's have a look at a few more functions and formulas examples hande for every-day use. Suppose your data is written partly as numbers and partly as text: 300 euros, total - 400 dollars. But you need to extract numbers only. It pulls the text by mask with a regular expression. text - it can be cell reference or any text in double quotes. regular_expression - your text mask. Also in double quotes. It lets you create almost any text scheme possible. Note. 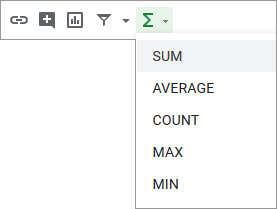 Google Sheets sees the extracted values as text. You need to convert them to numbers with the VALUE function or with our Convert tool. 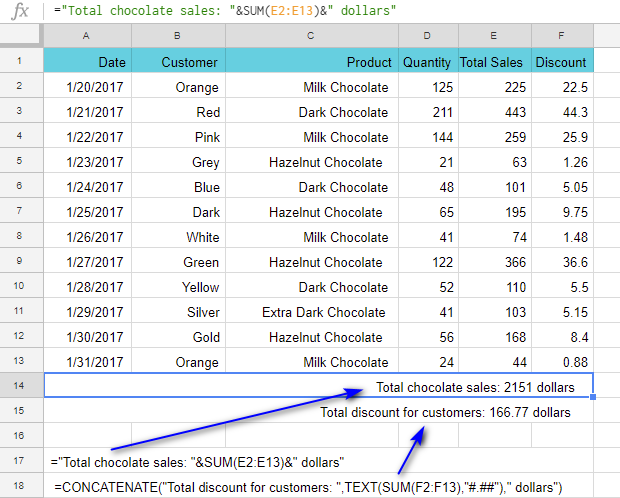 Formulas within the text help getting a neatly looking row with some totals - numbers with their short descriptions. 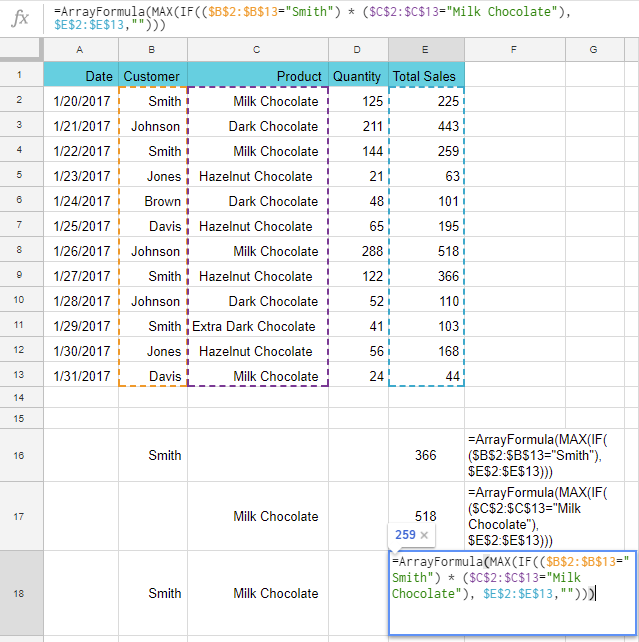 ="Total chocolate sales: "&SUM(E2:E13)&" dollars"
To make my numbers decimals, I use the TEXT function and set the format: "#,##0"
What if you upload the data from somewhere and all numbers appear with spaces, like 8 544 instead of 8544? Google Sheets will return these as text, you know. where A2 contains 8 544. How does it work? The SUBSTITUTE function replaces all spaces in the text (check the second argument - there's space in double quotes) with an "empty string" (the third argument). Then, VALUE converts text to numbers. Tip. You can switch between cases in a click with the corresponding utility from our Power Tools.